_____rawr the Anchorman: Good afternoon all you superfans, and welcome back to the most-watched show on television, where you'll find the most in-depth coverage of the 12th Altador Cup!!! First, let's hear what the weather is like down in Altador! Dazyi the Meteorologist: Well, _____rawr, as you know, today is the 20th day of Relaxing, Neopian Year 19... and today's weather in Altador is boiling hot!!! The summer heat waves are early this season, causing the average temperature down there to max out at 58 degrees Celsius - that's 137 degrees Fahrenheit, for you other folks. _____rawr the Anchorman: Sounds like there'll be a long line down at the Slushie Slinger stand! Dazyi the Meteorologist: Yeah, I'm glad it's much cooler down here in Neopia Central! Cxuh: Well Ted, who better to talk about Shootout Showdown than the Jelly Chia himself! He's kindly agreed to give us an interview, and ten minutes of his time! Jelly Chia: It's my break, actually. Cxuh: Oh sorry, would you like to get back to it? Jelly Chia: No, it's ok.
Cxuh: Well I can have my assistant get you a slushie at least, it's unbelievably hot out here! Cxuh: Mindlerae! Mindi! Can you get us two Chokato Slushies? Thanks! Jelly Chia: Thank you, that's real kind of you guys. Cxuh: No problem! So what part do you play in the Altador Cup? Jelly Chia: I'm the Goal Keeper down at Shootout Showdown. Cxuh: Now you weren't part of the First Altador Cup? Jelly Chia: No, I started up during the Fourth Cup. Cxuh: And why is that? Jelly Chia: Well some people felt that there should be more side games. Lots of people were losing their voices at Make Some Noise, and not everyone is able to sling that many slushies, maintain quality customer service and keep things tidy down at the Slushie Slinger! That really is harder than it looks. So it was decided that there should be an area for Neopians to practice their skills down at my net and represent their team while they do it. Cxuh: And what type of Neopets usually come by? Jelly Chia: Oh all sorts, we get everyone at one point or another. We've had everyone from Beginners to All-Stars down here. 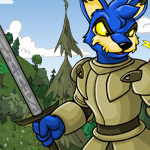 We've seen Baby pets and trained Battledome champions, and of course just your regular average Neopet, trying their best to bring in some extra points to support their team. Cxuh: Does it get tiring, jumping around in the net all day throughout the entire Altador Cup? Especially in this heat!! Jelly Chia: Not at all. I love this job; that's why they hired me! I meet the most interesting people down here and I'm always happy to help everyone improve. Yooyuball isn't too different from this, you know! And I've seen almost every single player on those Cup teams come through here before they made it big. Who knows? Maybe I've seen the next Cup's MVP down here already! Cxuh: What an exciting thought! So do you have any special tips for those looking to improve their Shootout Showdown scores? Jelly Chia: Well, first of all, I recommend kicking when you're ready to give it all of your strength. No point in kicking it gently, that'll be far too easy for me to block! Keep an eye on my movements and when you think you've spotted a hole in my defense, kick the Yooyuball as hard as you can! It's also tricky for me to block Yooyuballs coming in at an angle, so if you're advanced enough, try putting a nice spin on the Yooyuball as you kick it. If it looks like it's going to the right, I'll go right, and it'll sail right past me into the middle! But of course the most important thing is to have fun. That's what this whole Cup is about! Cxuh: Well, doesn't everyone have fun? Jelly Chia: Well once we had Aristotle A. Avinroo down here... You know, AAA? And he got upset because he didn't score as many goals as he wanted to get within sixty seconds. He was pretty mad! His sister Abagail was trying to tell him that he scored way more than most people, but he was yelling that he wanted to have the best score in all of Neopia. The line was pretty long though, and I told him he'd have to get to the back of it if he wanted to go again, so he stomped off... I think he was going to the Slushie line; he probably needed to cool off. He's a good kid, he's just really competitive. Cxuh: Oh, speaking of, here's your slushie! Jelly Chia: Oh thank you, but I don't actually have time to drink it now, my break's just about over and I've got to head back. Let Mindi keep it, I'm sure she would enjoy it! Mindlerae: Oh! But- well! Thank you, but I got it for you! Jelly Chia: No you go ahead and drink it, it's already started melting and I'm running late now. Jelly Chia: Come down and support your team! Every goal counts! Cxuh: Well! That was really nice of him to use his break to talk to us. So there you are, our exclusive interview with the famous Jelly Chia, the Goalie down at the Shootout Showdown! Oh my goodness, I didn't even ask his name! Does anyone know his name? Anyone? No? Ok well I guess we've got our first question for our interview next year! That's it for us down here, back to you _____rawr! Next Roxias gazed at the lupess for a moment, his ears drooping slightly as he did. But then his ears, as well as his body, straightened up, and he carefully stowed the picture in the pocket of his tunic right over his heart. “I will make good, Mam. I promise. It's not easy being a Kiko. Win the Altador Cup in Y17, still can't get any respect.